Here's a documentation & learning tip which can really add significant value to your trading knowledge, and in time to your level of skill and confidence. How to recognise the environment / the features of the environment. The nature of price movement within the environment. How to identify a likely change of environment. How to profit within the environment. Break each of these down to subcategories. I'll let you determine your own subcategories over time, as your document grows. The following image gives the general idea, although the format could vary from notebook to loose-leaf folder to One Note document to spreadsheet or even a mindmap. Whatever works best for you is fine. Set it up now… and build on it by recording ANY significant observation or lesson discovered during trading, during your post-session reviews or during ongoing education whenever you find a new insight or some new information. Make it a living, growing document. You'll find it becomes an exceptional tool for your ongoing review and study. Plus if you stretch yourself to find new information as you trade or review your sessions then it will become a vital component of your deliberate practice learning processes. PS. 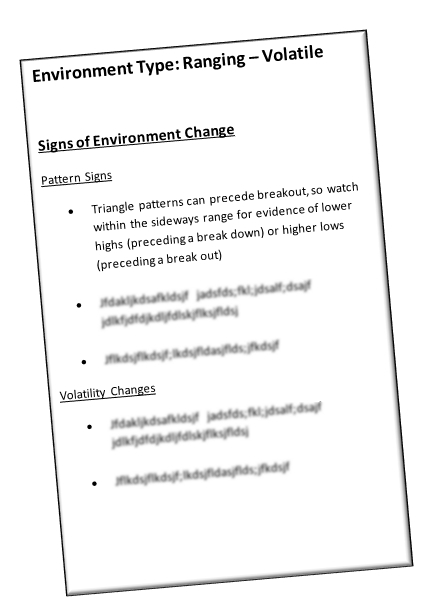 For YTC Price Action Trader readers, this is a subset of the Lessons Learnt Journal discussed in Chapter 14, P108.